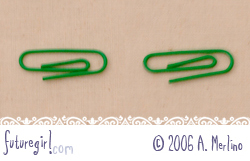 I've been using vinyl-coated paper clips as stitch markers for years. At first it was out of necessity. I just grabbed some while I was crocheting. When that project was done, I tucked them in with my hooks, so I kept using them. I've lost some here and there over the years, so I thought I'd treat myself to some grown-up stitch markers. I was shocked to find out that stitch markers cost about 12 cents apiece for about .003 cents worth of plastic. That's ridiculous. 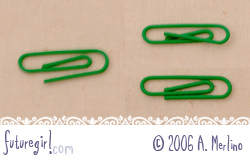 Especially when I can find vinyl-coated paper clips just about anywhere for cheap. 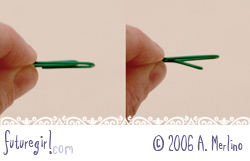 Even though I'm thrifty, I probably would have just plunked down the $3 for 24 stitch markers, but they had little plastic knobbies on them that would catch on the yarn when you mark a stitch. Come on! Couldn't they at least make the edges smooth? 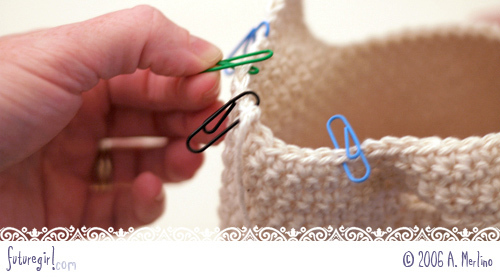 First, I squish the interior loop so it is tighter. Second, I bend the interior loop so it's closed. Third, I angle the interior loop so its tip is centered. Fourth, I bend the exterior end in so it rests tightly against the interior loop. This works best when I bend it a little too much inside first, then adjust it so it rests tightly against the interior loop. Fifth, At the point where the exterior end touches the interior loop, I bend the interior loop down a little. After the modifications, I can hold the end with the interior loop facing down and easily thread the interior loop in/under a stitch. 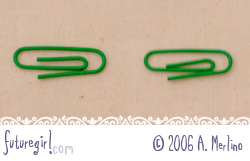 Because I closed the exterior loop, the paper clip won't fall off easily. 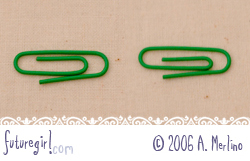 You can find vinyl-coated paper clips in a ton of cool colors and sizes for super-cheap. I even have some funky striped ones. 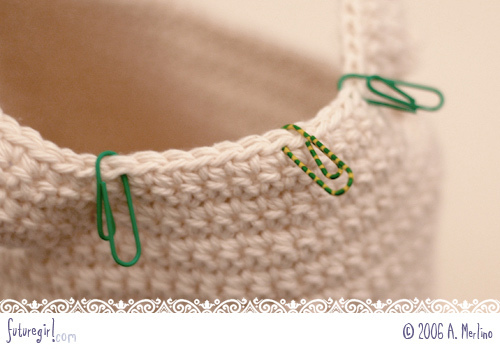 You could use metal ones, but if you are like me and leave projects sitting, sometimes for months, metal ones could rust and mar your yarn. I've never had a problem with the vinyl-coated ones, and I've been using some of them for over 10 years.